Let me introduce you to our newest border collie, Joy. And what a joy she is! She is 4 years old, and is extremely lovable. She loves to cuddle up on the couch as much as she loves to chase after the geese. She is strong, fast and is extremely intelligent. 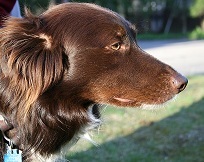 Border collies are one of the smartest breeds, and ideal for chasing geese for Ohio Geese Control. Their wolf-like glare and crawl up abilities really instill the fear of a predator. Our dogs may look tough, but they will never harm a goose or gosling. In fact, our tactics of utilizing border collies to harass Canada geese are recommended by the Humane Society and the Department of Natural Resources. It is a very humane and natural way to allow people and Canada geese to coexist. This entry was posted in Border Collie, Canada Geese Management, get rid of geese, Ohio Geese Control and tagged border collies, Border collies to get rid of geese, herding dogs, intelligent dogs by Jeff Hower. Bookmark the permalink.